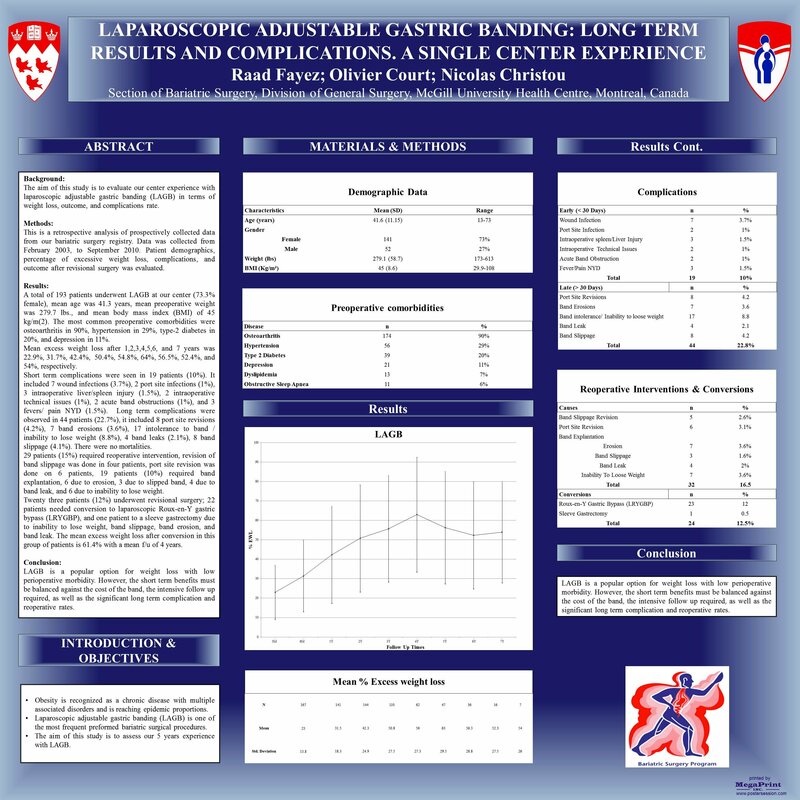 Background: The aim of this study is to evaluate our center experience with laparoscopic adjustable gastric banding (LAGB) in terms of weight loss, outcome, and complications rate. Methods: This is a retrospective analysis of prospectively collected data from our bariatric surgery registry. Data was collected from February 2003, to September 2010. Patient demographics, percentage of excessive weight loss, complications, and outcome after revisional surgery was evaluated. Results: A total of 191 patients underwent LAGB at our center (73.3% female), mean age was 41.3 years, mean preoperative weight was 276 lbs., and mean body mass index (BMI) of 45 kg/m². The most common preoperative comorbidities were osteoarthritis in 90%, hypertension in 29%, type-2 diabetes in 20%, and depression in 11%. Mean excess weight loss after 1,2,3,4,5,6, and 7 years was 22.9%, 31.7%, 42.4%, 50.4%, 54.8%, 64%, 56.5%, 52.4%, and 54%, respectively. Short term complications (< 30 days) were seen in 19 patients (10%). It included 7 wound infections (3.7%), 2 port site infections (1%), 3 intraoperative liver/spleen laceration (1.5%), 2 intraoperative technical issues (1%), 2 acute band obstructions (1%), and 3 fevers/ pain NYD (1.5%). Long term complications were observed in 41 patients (21.6%), it included 8 port site revisions (4.2%), 6 band erosions (3%), 16 intolerance to band / inability to lose weight (8.3%), 4 band leaks (2.1%), 7 band slippage (3.7%). There were no mortalities. 29 patients (15%) required reoperative intervention, revision of band slippage was done in four patients, port site revision was done on 6 patients, 19 patients (10%) required band explantation, 6 due to erosion, 3 due to slipped band, 4 due to band leak, and 6 due to inability to lose weight. Twenty three patients (12%) underwent revisional surgery; 22 patients needed conversion to laparoscopic Roux-en-Y gastric bypass (LRYGBP), and one patient to a sleeve gastrectomy due to inability to lose weight, band slippage, band erosion, and band leak. The mean excess weight loss after conversion in this group of patients is 61.4% with a mean f/u of 4 years. Conclusion: LAGB is a popular option for weight loss with low perioperative morbidity. However, the short term benefits must be balanced against the cost of the band, the intensive follow up required, as well as the significant long term complication and reoperative rates.